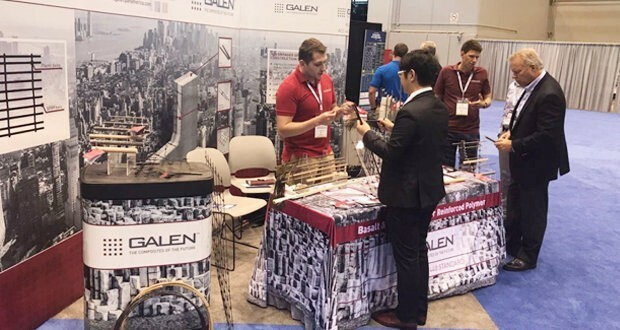 Galen Ltd showcased its basalt fiber reinforced polymer products at JEC World 2017 — Future of Composites in Construction, which was held in Chicago. It is the major international trade fair dedicated to composites in construction, stresses JEC Group. The Russian company brought the exhibits to Chicago making it possible for the prospect customers and partners to see first-hand their offers for one of the most promising and rapidly growing composites market segments. The experts forecast that the US industrial and civil construction industry will provide up to 15% growth in the composite market in 2018. This is caused by the following: the need to rehabilitate aging infrastructure, continued urbanization in the Asian countries, and recovery of the US residential housing market. The trade fair was held in a traditional format for JEC World and included several events. Firstly, it was a trade-show entirely dedicated to the segments of the construction market. 2-Day JEC Construction Symposium was held as part of the main event. Its sessions focused on the possibilities of composites in building, composites as a worthy alternative to traditional materials, and also safety and durability of composite materials. Job Center and Education & Skills Village. JEC Group organized a guided tour of the IIT College of Architecture in the Chicago area, thus giving participants an exclusive opportunity to benefit from a visit of the campus and composite facilities. Of note, COMPOSITES EUROPE 2017 will dedicate an entire trade fair day to building and construction in the composites world. According to the market analysts, fiber reinforced polymer rebar market size is posed to surpass $1.25bn by 2024.